Signed lower right and on barrel, "HN and WS". The contrasting textures and subtly modulated hues of this warm, sunny mountain valley; the high-rising rocks and trees that form a strong vertical element; and the picturesque buildings in the background reflect the artists' debt to Dutch Italianate landscape painters. 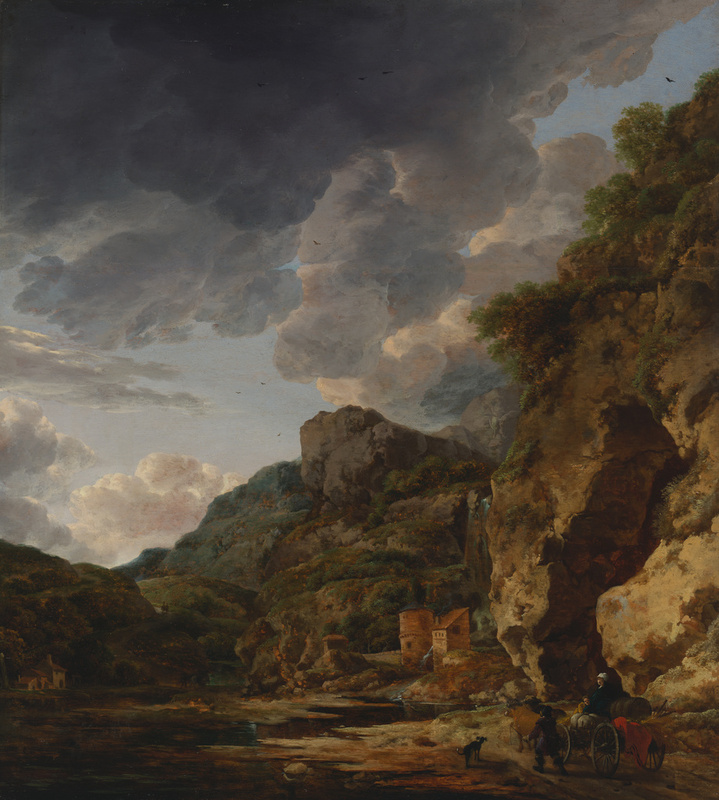 Dutch landscapes of this type were collected in eighteenth-century England and France, where they influenced the development of Rococo landscape painting. A landscape specialist, Herman Nauwincx usually collaborated with a figure painter, in this case Willem Schellinks, who adapted himself easily to the style of Italianate artists such as Nauwincx. Both artists were active in Amsterdam, where this poetic panel was probably painted. The subject of a wooded mountain landscape with water in the foreground is typical of Nauwincx, whose prints offer parallels with this scene. Childs Gallery (Boston, Massachusetts), sold to Oscar Salzer, about 1962. Oscar Salzer (Los Angeles, California), sold to the J. Paul Getty Museum, 1969. Fredericksen, Burton B. Catalogue of the Paintings in the J. Paul Getty Museum (Malibu: J. Paul Getty Museum, 1972), pp. 84-85, no. 111, ill.
Blankert, Albert, and Alexander Nystad. "Herman Nauwincx als schilder en tekenaar." Tableau, no. 5. (April-May 1979), pp. 50, 53, no. 7. Sutton, Peter C. A Guide to Dutch Art in America (Grand Rapids: Wm. B. Eerdmans, 1986), p. 145. Jaffé, David. Summary Catalogue of European Paintings in the J. Paul Getty Museum (Los Angeles: J. Paul Getty Museum, 1997), p. 91, ill.